One of my favorite things about summer is having boxes and boxes of herbs growing on the porches, ready to snip and pluck and enliven dinner with their presence. This year my container herb garden expanded with the addition of some herbs I planted specifically with dessert making in mind: lemon verbena, English lavender, orange mint and lemon balm, but there are many other herbs that while usually experienced in a savory situation, lend themselves well to sweets too. I've been really inspired by the scents and flavors of summer herbs and flowers lately and given the heat of the season, ice cream has been a perfect vehicle for experimenting with them. We've just hit strawberry season here in New England and since having a strawberry-basil martini at Cuchi-Cuchi (a decadently over-the-top special occasions spot for drinks in Cambridge) I've been wanting to do a basil and strawberry dessert. Strawberry and basil are unexpected but well recognized partners and it seemed impossible to go wrong with a strawberry pie à la mode, but it was unthinkable that my first strawberry pie of the season not be a strawberry-rhubarb pie and I worried that the sour bite of rhubarb would throw off the delicate meld of fruit and herb flavors. Worried needlessly, I should say. In fact, this combination was summer heaven. 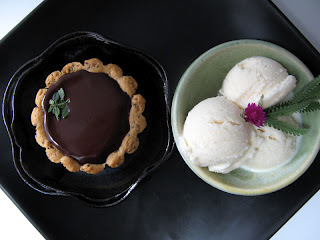 The creamy intensely basil-infused ice cream seemed a perfect match for the sweet-tart pie, so much more interesting and well matched than a vanilla ice cream. It was the kind of good that inspires dreams at night and prompts people to dish themselves up a generous portion for breakfast the next morning. Now, I grew up in a home where pie, especially strawberry rhubarb, was seen as a perfectly acceptable breakfast, but even I had a moment of nutritional horror when I saw this emerge from our kitchen at 8am. A basil garnished plate with a huge wedge of pie and four scoops of ice cream? What do you think? Was the line of breakfast decency crossed here? With the success of the standard Italian variety of basil in ice cream, my thoughts wandered to its neighbor in the herb garden, Thai basil. Thai basil has a notable anise/licorice flavor that complements its sweet herby basil notes as well. It's a beautiful herb with a sharper, more elongated leaf than Genovese basil and bright purple stems, as well as deeply purple flowers and a taste to match its dramatic appearance. The flavors of Thai basil are more layered and complex than they are in Italian basil and I knew as soon as I tasted my first batch of basil ice cream that it would be even better with Thai basil. So, the very next day: Thai basil ice cream. I made it exactly the same way I made the other basil ice cream and could tell as soon as it started steeping in the hot soy milk, releasing coils of heavily anise-basil scented steam that this ice cream was going to be next level. And indeed, it tastes incredible. It's a cool, creamy distillation of the exquisite flavors of Thai basil, at once full of overwhelmingly gorgeous crisp flavors and softly aromatic earthy green notes, but all in balance like a Thai palace, delicate and impeccable, so beautiful its intricacies can't seem gaudy. Curious if Thai basil would pair as well with strawberries as its Italian relative, I tried serving it on top of strawberries cooked on skewers over dying coals in the grill. Grilled strawberries are a perennial favorite around here in the summer. My favorite way to prepare them is with a quick marinade of brown sugar and brandy, but here it was just a fresh strawberry straight to the grill to warm and turn into a sweet, syrupy delicacy all on its own. I suppose I shouldn't have been surprised that the berry was a wonderful partner to Thai basil ice cream, but it was just so unexpectedly good and exciting that it made me want to make ice creams out of every herb in the garden, just to see what would happen. I might have launched my full-fledged herbal ice cream experiments with rosemary ice cream (still on my list) but I got diverted by an interesting herbal discovery: laksa leaf. Here's the thing about laksa leaf, I'd never cooked with it before. I've eaten laksa leaf in laksa, the sort of national curry of Malaysia, a rich yellow coconut broth with rice noodles that is often eaten for breakfast, but I'd never seen it for sale in the States. Rather, I never knew that I'd seen it, though in fact I had under its various other names: Vietnamese mint and Vietnamese coriander, I just never knew it was all the same thing. So when I came into possession of "rau ram" and had to do culinary sleuthing to figure out what that was, it was a miraculous discovery to find that rau ram is a staple herb of Vietnamese cooking, hence the English references to it as Vietnamese mint and/or coriander, but it is also known as laksa leaf in Malaysia, Singapore and Indonesia where laksa is immensely popular. Laksa leaf's English names, Vietnamese mint or Vietnamese coriander are apt given its primary culinary usage in Vietnam, and given that it tastes a little bit like both mint and coriander in equal measure and all at once, though it is not botanically related to either. It also has a deeply peppery spice to it which is heightened with cooking and a bright lemon scent which, unfortunately, seems to dampen with cooking. Riding high on the Thai basil ice cream, I thought the spicy edge, which I really like in sweets, combined with the minty, citrus tones of laksa would be great in ice cream. Long story short, it's not...exactly. Not that it's not good or compelling, it's just not great like the Thai basil ice cream. It's salvageable though. Laksa leaf ice cream can be made tastefully, I'm convinced. On this first try I think user error may have been partially to blame for the less-than-ideal outcome. Definitely too much laksa leaf for one and maybe not enough other stuff for two. In this batch I used a rich coconut milk base and palm sugar, both laksa ingredients, but maybe galangal, ginger or lemongrass, all of which are used in in the spice paste for laksa, would improve this ice cream. Experimenting with tia to, a Vietnamese herb that is related to shiso, which is used in a fair bit of Japanese cooking and is sometimes referred to as Japanese basil, I also thought would be a successful venture. Again, short story: it wasn't really. I'm not even as convinced about the possibility for delicious results on this one as I am with the laksa leaf ice cream. There was a basil element to the flavor, as well as an edge of anise that had me thinking that tia to might be close to Thai basil's flavor profile. However, tia to also has a strong, almost medicinally intense pepper/menthol scent to it that, in truth, made me flinch. So, I'm taking this as a well earned, out and out failure. Sometimes when you gamble you win big and sometimes you've just got to shrug and biking over to the store for cookie dough ice cream. Having kitchen failures is both scary and inspiring. It hurts to completely bomb out on something, but it can keep you reaching for the next thing, hoping that it will bring success, or at least validation. And so I was relieved to risk it all on pandan ice cream and come up aces. Many people call pandan (screwpine in English) "Asian vanilla," but that's not a particularly useful description because it doesn't in fact taste anything like vanilla. Pandan, a long flat, grassy looking leaf, is popular in Malaysia and is used in savory dishes as well as in sweets. It's usage in sweets throughout Southeast Asia partially accounts for its comparison to vanilla. It is an expected flavor and a necessary aromatic in many popular desserts. Like vanilla, it has an elusive quality that tastes like comfort, like something you'd want to swath yourself in. Pandan is nutty, toasted, floral, warm, grassy, intoxicating, delicately soft and yet demanding and captivating. It's sold in extract form in many Asian markets in the States, but usually has a great deal of green food coloring added. I prefer the frozen leaves anyway, also readily avaliable in Asian markets, which give just a tiny tint of palest green when used. Pandan is also not for everyone. This was a hit or miss ice cream with tasters, but I adored it, especially on top of a slice of dense and fruity lychee cake, inspired by the lychee butter cake on Dessert First, which was incredibly delicious. I especially liked the idea of using lychee syrup as the liquid in this recipe and found that it worked very nicely to sweeten and so used much less sugar than the original recipe called for. The cake also turned out nicely with oil instead of butter and was plenty rich, especially à la mode. Pandan gained a larger following with this chocolate variation that also made use of a coconut milk base. While I love the flavor of pandan on its own, I'll concede that the chocolate did transform it into something pretty delectable. To go with this ice cream, I was going to make baby banana fritters from Pichet Ong's Sweet Spot, which I should hardly have to mention that I'm in cookbook love with, but intense and horrible heat in the Northeast made me think a super quick sear on the bananas was a better bet. With half a lychee cake left and all the pandan ice cream gone, I thought back to the original accompaniment to the lychee cake on Dessert First, strawberries with rose cream. I don't happen to grow roses in my garden, but a tin of rose jam from the Indian market has been haunting my shelves for a while waiting for the perfect inspiration and I immediately reached for it. With an almond milk base and no additional sweeter, this light rose ice cream struck us all dead silent as we ate it under the stars during the intense heatwave last week. It was floral, of course, but wonderfully so, light and refreshing, not cloying or sickly-sweet. It was bliss, and perfect with the lychee cake. A note on making ice creams: I'm using this Cuisinart ICE 50BC ice cream maker. It's serious. I got a deal on it and would probably balk at buying a full price one, but if you can find a deal or don't mind a splurge, it's pretty awesome. Even it though, which promises ice cream in 30 minutes or whatever nonsense, does not deliver miracles. The ice cream pictured above is the consistency you will get after running an already chilled mix for about half an hour in the ice cream maker. It's quite enjoyably edible, but not perfectly frozen through. To get it to really set up, you'll need a couple-few (that's a Western NY-ism from my younger days meaning, "I don't know really, two or three?") hours in the freezer. As far as bases go for the ice cream, I got inspired by the pastry cream I've been working with, which involves cooked tapioca starch. The mixture becomes pudding-like and freezes in a wonderfully textured way--not too hard, not too icy, but just creamy and meltingly delicious. As far as liquids, a mix of soy, nut or rice milk with something heavier does the trick nicely. Coconut milk is nice in situations where you'd like to impart a little coconut flavor, otherwise my ice cream base of choice is currently unsweetened MimicCreme. It's made mostly of almond and cashew and it's rich and creamy and pretty wow. The price is also wow, but if you've made your own nut milk lately, this seems a pretty good deal. On their website you can buy a case of twelve at a per unit cost of $4.59 and there's apparently no shipping charge (?!) if you take ground shipping in the United States, making it a good dollar+ less expensive than I've seen anywhere else. And that, my friends, will make a lot of ice cream. In a medium saucepan, gently heat the soymilk, cream and basil until the mixture boils. Cover immediately and leave to steep for an hour. With an immersion blender or in a food processor, puree the mix for one minute. Strain through a mesh strainer, pushing hard against the basil pulp with the back of a spoon to extract all of the liquid. Return the liquid to the stove top and heat again, stirring in the the sweetener, tapioca starch and salt. Continue stirring until the mixture reaches a rolling boil and thickens to a pudding-like consistency. Pour mixture into a wide, flat dish and cool throughly before finishing ice cream with your ice cream maker. In other news, I was happy to receive a VegBloggy award a couple weeks ago from VegNews magazine and am really gratified that people find this blog interesting. It's definitely an honor to just have readers, so thank you all very much. There will be a feature on vegan blogs in the newest issue of VegNews, so look for it! In other, other news, I just got through my first week of farm share veggies and will soon post the results. Think: pea tendrils! There's something emotionally complex about the American winter holidays for me--Christmas and New Year's. Festive, fun, but also bittersweet, a soft sorrow of something not quite achieved, something reached for and only just brushed with fingertips before it moved completely out of reach. Maybe it's the fleeting nature of friends and family all gathered together, knowing it will be over too soon, perhaps it's the fragile hope that we can gift wrap joy or clean the slate and start over as another year begins anew. This year's holidays, while they brought plenty of sweet, both tangibly with great food and ephemerally in sharing time with many of the people I love, had more than the standard brow-furrowing little edge of sadness. 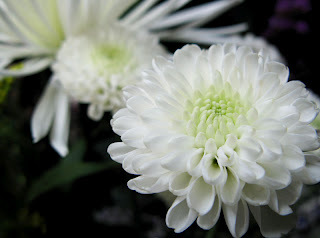 The white flowers pictured above were sent to us by our good friend, Ted, with whom we've said goodbye to another fine feline once (Benten, baby, we still miss you). He sent them to celebrate the beautiful life that our cat, Odin, got to share with us. We said goodbye to Odin on December 27th in our home with a very kind and compassionate vet. If you ever have to help any of your animals pass, I would suggest trying to find a veterinarian who will come to your home. It was the most peaceful and comfortable way I think Odin could have experienced his final moments. It's ridiculous to write about how hard this was and how much I miss him--there aren't even words, but staring into the curved little petals of the flowers Ted sent, arranged in miraculously perfect symmetry, I find myself able to give something over to the mysteries--cruel and crushing though they may be--of the natural world. It doesn't mean I don't feel devastated by a sense of unfairness, but like many things that I've faced in 2007, there's just no amount of mental wrestling that will make me feel ok about it and so I do what I'm learning more and more how to manage--look toward the positive and pull the comfort of family, friends and shining bits of good fortune a little bit closer. If there's one thing that the horrible weight of loss is good for it's making you focus on what's not lost, on all that you have, and all that you will have. And there's the ring of hope in that preceding sentence, a chin squaring with resolve to pick myself up and just go on, but damn if it isn't hard. Perhaps it's just impossible to transition honestly and artfully from grief to samosa. These tangy and spicy little triangles were the opening to a Christmas dinner we shared with my family in our apartment, where they kindly agreed to come after it was clear we could not travel for the holidays. We'd agreed to an Indian theme for Christmas dinner and what better way to start the feast but with samosas stuffed with potatoes I dug at Parker Farms? Our family tradition for Christmas in my pre-veg days alternately involved ham and lasagna, but soon after transitioning to a vegan diet, we introduced this new family tradition where each year we pick a different cuisine and develop a feast around it. It's fun way to take the emphasis off things you won't eat with your family and bring in a new way of sharing meals together. This year things were a little scaled back, but we still turned in a very respectable feast in just about three hours of work. 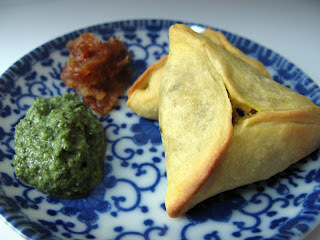 We began with samosas and baked pakoras made with cauliflower, potato and peas in a chickpea batter, both of which were liberally dosed with freshly made chutneys: a spicy date chutney with tangy tamarind and a cool mint chutney. 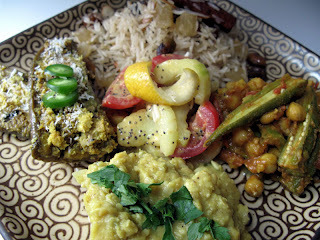 Then we moved on to plates piled with veggies, dal, and rice. The rice is one of my favorite dishes--a comforting and indulgent pile of long grain white basmati rice cooked with cinnamon stick, cardamom pods and cumin seeds before being gently fried with garlic and doctored with chopped dried apricot, candied pineapple and pumpkin (brought back from India by my parents on their recent trip there) and finally tossed with salty roasted pistachios. We also enjoyed another one of my favorites, a South Indian style eggplant dish where the eggplant is stuffed with dried coconut, tamarind paste, spices and lime before being cooked "face down" against a bed of cumin and mustard seeds. Even my dad, who has spared very few positive thoughts for eggplant in his years, was somewhat won over. 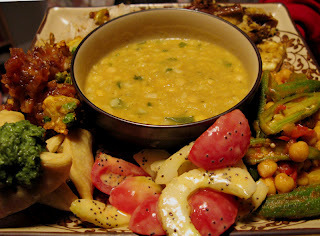 We also had an simple curried tomato and okra dish with chickpeas, as well as a festive five bean dal, cumin peppered papadam (freshly toasted by my mom), and to cut some of the spice, a light cucumber and tomato salad with sweet curry soy yogurt and poppy seed dressing. After the traditional break for digestion, we made some room for cups of chai (made with Bazu's wonderful whole spice chai mix) and darjeeling tea, also brought back by my parents from India. 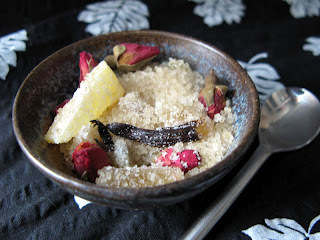 We sweetened the black tea with this floral and fruity sugar that I made earlier in the week to let the flavors meld. This is a great little thing to have on hand to make tea a special treat anytime. Just take some sugar and toss in candied fruits (I used pineapple and kumquat) and some dried rosebuds (make sure they are fresh and fragrant--they can loose their potency) and a little section of a vanilla bean, keep it in a sealed container and just stir into your hot tea. We also enjoyed a beautiful dessert prepared by my dad who didn't get his fill of kheer by half in India, so he whipped up this vegan version for us. 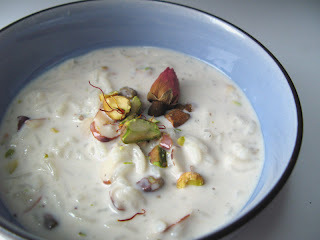 He used long grain white basmati rice, toasted almonds, cardamom, cinnamon, coconut milk and soy milk to come up with this incredibly luscious dessert that was all creamy, sweet and spicy. Finished with a pinch of Spanish saffron from our trip to Barcelona, some chopped pistachio, a drop of rose water and a dried rose bud (just for decoration), I couldn't imagine a better ending to the Christmas meal. It's comforting creamy rice pudding simplicity combined with its dynamic flavoring totally trumped the overly complex and heavy dessert I had planned to make--coconut sorbet topped with garam masala batter fried bananas, cinnamon sauce and delicate rolls of pistachio tuile cookies. Maybe sometime when we haven't had a multi-course dinner I'll get back to that dessert, but I'm awfully glad to have spent the time I would have invested in making it sitting around drinking tea and enjoying my dad's kheer instead. I was also happy to sit around stuffing my face with candy as my family and I decorated our annual gingerbread house. My parents have gotten the construction of the house down to a science. They draw up plans, roll out the delicious gingerbread, cut it, bake it and assemble the structure with hot sugar as glue. Then we all sit around with pastry bags of stiff vegan buttercream and decorate a side of the house. As you can see, it gets a little crazy looking, but it is always fun. 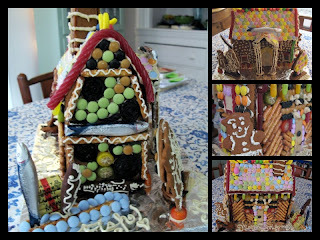 I haven't done enough research to actually stand behind this fully, but it seems like the tradition of gingerbread houses may have come from the building of Hexenhaus (literally witch's house) in Germany, named for the tempting house of candy and cookie in the German fairy tale of Hansel and Gretel. It came to be a practice in America with German immigrants, but lost its association with witches. Gnawing my way through the remnants of my family's hexenhaus, I undertook a second big dinner the next week to welcome in New Year's with some of my friends. We cracked open more bottles of wine than was strictly speaking smart and rang the new year in with festive food, beginning with this green leaf lettuce salad with comice pear, a few surprisingly good out of season raspberries, homemade croutons with mixed dried herbs from my garden, and a fresh raspberry and balsamic vinaigrette. 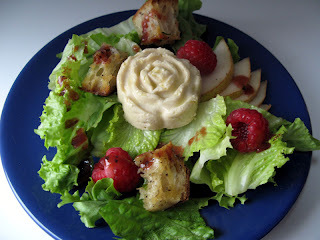 Each salad was also topped with a different flower of pressed cashew cheese. I used an incredibly cute petite four pan, well greased with olive oil and firmly pressed in a warm mixture of cashews, silken tofu, miso, tahini, nutritional yeast, lemon and spices. And then I just hoped for good luck, which I was granted as they all came out well formed. We followed the salad with a warm bowl of Moroccan-spiced celeric and parsnip bisque, again made with the vegetables we harvested from Parker Farms before Thanksgiving (they are all stored in our "root cellar," i.e. on top of a disused washing machine from tenants of old in our basement). I finished the bisque with a dollop of saffroned pinenut cream, a drizzle of herbed Spanish olive oil (also carried back from Barcelona) and a good grinding of black pepper. 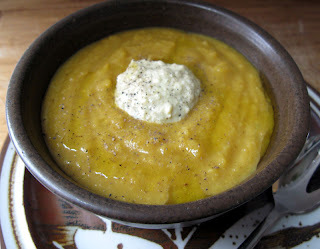 It was a complexly earthy soup, creamy, deep, warming and decadent with the saffron and rich olive oil. 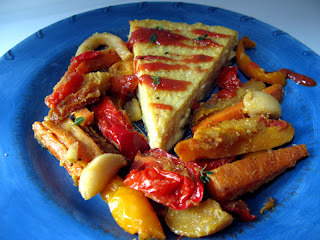 Our main course was a carmelized shallot chickpea polenta tart (with inspiration from the Voluptuous Vegan--chickpea polenta is really insanely creamy and delicious, no one can guess what it is) drizzled with a fire roasted tomato and thyme sauce and surrounded by white wine and agave roasted vegetables, again making use of our harvest with parsnips, turnips, and carrots with some bright bell peppers and a few roma tomatoes to add color. And to finish? Ice cream. I know, I know, stop with the Wheeler's Black Label already, but I can't help myself...though I am now officially out so I either need to beg some or go back to making my own pale imitation. Knowing that there would be limited room for dessert, I made use of my collection of small bowls and little soy sauce dishes to serve tiny scoops of vanilla ice cream next to these mayer lemon and poppy seed crust tartlets filled with lemon thyme ganache. I love the combination of poppy seeds and lemon and the mellow citrus flavor of the mayer lemons was nicely balanced and not overwhelmingly tart or harsh. The tangy herbal notes of lemon thyme hit all sorts of new notes in the dark chocolate for me as well, proving that orange isn't the only citrus that works with chocolate. 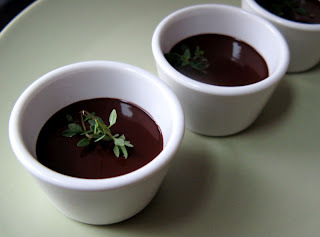 For an even lighter dessert option, I also filled these tiny cups with just a bit of the lemon thyme ganache and served them with little spoons. Lacking storage space in my small kitchen, I turned the tarlets into a centerpiece rather than just something else in the way by using this beautiful old tiered tea tray that I just got, despite the fact that I absolutely do not need a tiered tea tray. Seduced by the beauty of completely useless things. Oh well, call it a Christmas present to myself. I think one of my favorite poems, "Essay: The Love of Old Houses," is my frame for 2008, a reminder that nothing comes to us fresh and shining and new, we build on and grow from everything and with everything--each loss, each sadness, every set back, every minute around the table with people you've loved your whole life, each smile as glasses clink in a toast with friends you can't imagine your life without, all of the rumbling purrs and stretches of contentment, each morsel of delicious food melting on your tongue. these boards when company was coming. -Mark DotyHappy New Year everyone, let's all make the most of it. Kaitavimas by Bruno Kaitai. Ethereal theme. Powered by Blogger.